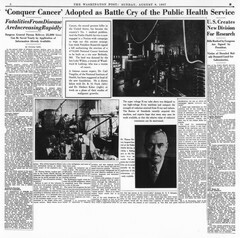 "'Conquer Cancer' Adopted as Battle Cry of the Public Health Service" was the headline on an article on page 2 of the Washington Post newspaper on August 6, 1937. President Roosevelt had signed a bill to authorize the National Cancer Institute, with Dr. Carl Voegtlin as the Chief. Shown are photos of Drs. Carl Voegtlin, R. H. Fitch, Herbert Kaher and Thomas Parran (Surgeon General).